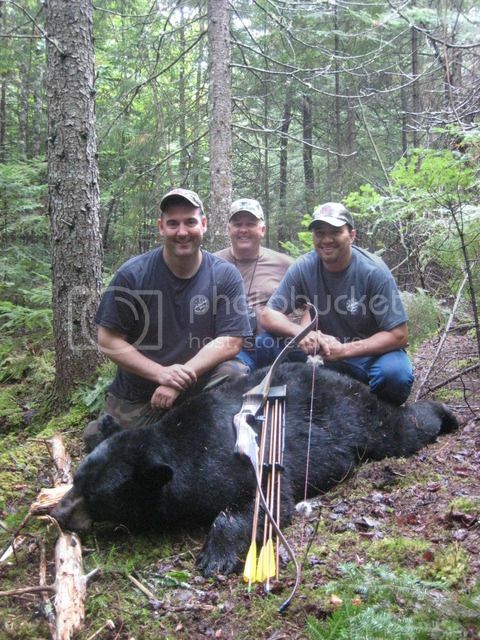 Looking into booking a fall black bear hunt over bait in Maine this year. I've contacted several outfitters and liked what I've heard. Has anyone here hunted up in the north woods and if so, do you have any recommendations as to a guide or outfitter? I hunted a long time ago with bob Johnson. He hunts out of a camp at narrow Pond. Great guy and guide. I believe he was Taku Outfitters in Ashland Maine. I shot P&Y bear with him. Eldon Jondreau is a trad guy, taxidermist and guide in the Portage Lake area. For a trad bear hunter he may be the guy to go to. Thanks Gil I'll check it out. Katahdin's Shadow (Home office in Sidney) Camp is in Haynesville, is really good so is Oxbow lodge in Oxbow Maine! In Search of a custom Lefty long bow! I don't know who the best Bear outfitter is in Maine, but I swear by Tony Boucher of Squapan Mountain Outfitters. I've hunted with him for 3 seasons, he caters to trad hunters, I feel the prices are more than fair. I think that he still has openings the first week with Roger and Toby from Black Widow. They usually put up a bow as a prize for biggest bear. Im not 100% sure, but this year, I don't think that you need to shoot a Widow to win. You can check out the Widow Wall on blackwidowbows.com for details. I hope you're right about Squash because I booked for the second week of Sept.
Benha, did you mean you booked with Squapan? If that's the case I doubt that you'll be disappointed. Tony and his guides break their @$$'s for their hunters. Its a real family atmosphere. I've hunted with him 3 times since 2010, and its killing me not being able to get back there this year. He sends out questionnaires to find out your preference in food, stand or blind, or any special needs. I'm going 5 miles north of Maine into New Brunswick for my first bear hunt since 1985 this June. It will be my first with a recurve as well. I killed two bears with compounds in the mid-1980's when DIY hunts were legal. I love the background of that trio with the bear! Good looking country. I wonder what the widow folks would think about non-widow hunters? I traded or sold all 3 of my widows in the past 2 years. Great bows I just preferred different ones. Eldon Jandreau no longer guides for bear. He sold Hunters Point a few years ago to Phill Allen. It is now called Mountain View Sporting Camps. Phill was a guide for Eldon. Everything is pretty much the same as before. Same guides, bait sights and gorgeous cabins. I only wish I was there right now instead of at work. Maybe next year. You can contact Phill at 207-615-2691. God bless, Scott. Mike Miller and 1 Guest are viewing this topic.